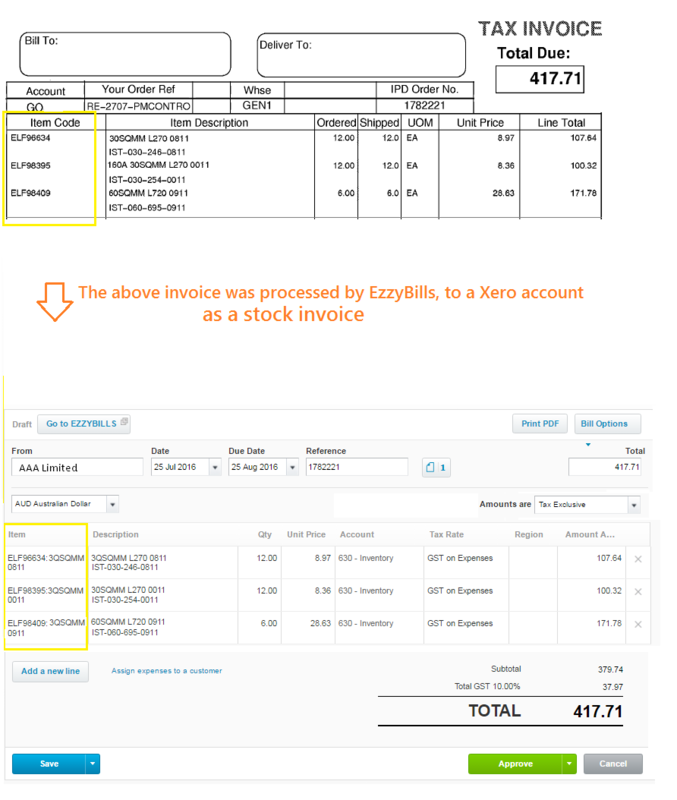 Stock invoices or item invoices in Xero are invoices that have “item” code. With the “item” code, Xero manages your inventory. login to EzzyBills, click Settings, then click to turn on the setting “Allow Stock Invoices“. Click Save Settings. If the item code on the invoice file exists in your Xero account, we will export this item code into Xero. If the item code on the invoice file does not exist in your Xero account, we will look for a matching item code in your Xero based on the description – namely “fuzzy item code” . If the fuzzy item code is found, we will export it to Xero; otherwise, the item code will be left empty when exporting to Xero. For any new item code, you will need to add the item code in your Xero account (Accounts -> Inventory, click “New Item”). EzzyBills does not create new item codes in your Xero inventory.